Was $499.99 Shop now and save! Rich, yet neutral colors allow for easy pairing with your choice of bedroom decor. Product Description First Class. Elevate your bedroom aesthetic with the dapper design of the Charlie Queen Upholstered Bed in Otter. Anchored by a simple yet stately velvet upholstered headboard, this piece is cool and collected, radiating opulent vibes in your space. Adorned with parallel rows of button tufting, the contemporary rectangular shape of the headboard is complemented by a matching upholstered frame and rails. Customer assembly required. Unique Features: Featuring parallel rows of button tufting and handsome tapered wood legs. A neutral gray velvet upholstery adds soft and soothing texture to your bedroom space. 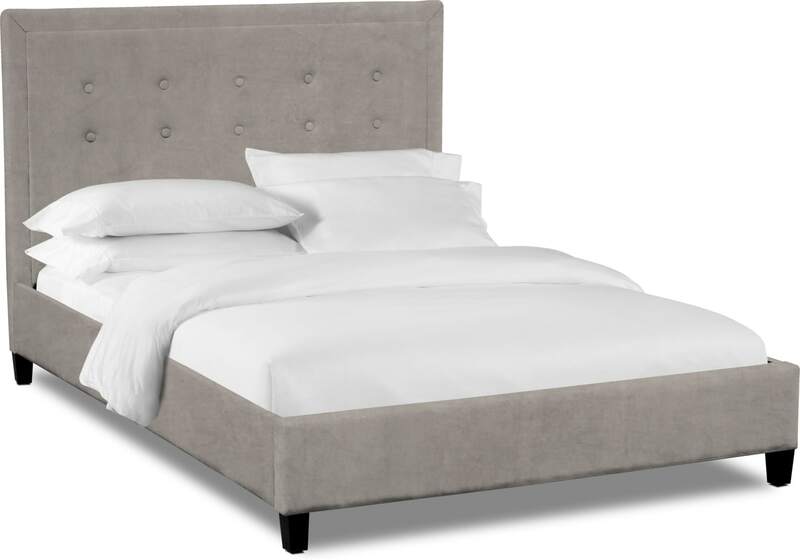 The matching upholstered footboard and rails add fluidity to the dapper design. Construction: Pine construction ensures a durable and resilient bed frame. Care Instructions: Spot clean using the foam from a water-based cleaning agent such as a mild detergent or non-solvent upholstery shampoo. Many household cleaning solvents are harmful to the color and life of a fabric. Apply foam with a soft cloth and brush in a circular motion. Vacuum when dry. Please note this product requires assembly.